We want to wish you all a Merry Christmas and Happy New Year! This year we are thankful to be back in the Philippines. 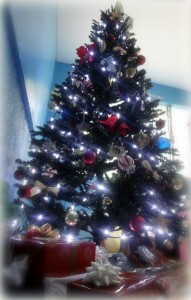 We felt blessed to be at North Cebu Baptist Church and celebrate this special season at home. We certainly miss our family and friends (that is something that will never go away) but there is such joy in knowing that you are in the place God wants you. 2017 was a year full of activity and change. At times it was overwhelming but throughout the year, God kept bringing us to this simple truth: He is everything we need and more. So this holiday season I found myself thanking God for Who He Is and what He has done! I am excited (and terrified) about what 2018 has to bring but no matter what, I know God is with me…and that is more than enough. 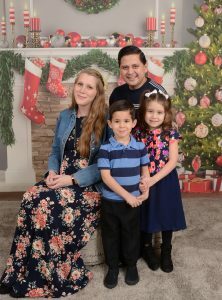 Merry Christmas from our home to yours! As we reunite with loved ones and exchange gifts, may we always remember that the greatest gift ever given was a baby. A baby who came to heal the broken and save the lost. In our dark world, it is Christ who offers hope to the hopeless and peace to the needy. Different cultures celebrate in different ways but for the Christian the emphasis remains the same. On Christmas Eve, we celebrated in true Filipino tradition. We got together with our college students and church staff and celebrated past midnight. The night was full of fireworks, fellowship, and food! Then on Christmas morning we celebrated the American way-our kids woke up and opened their treasures. Later, we had a birthday cake for Jesus and read the Christmas story. We hope you all had a blessed Christmas with your friends and families! May we use this time to reach out to the people around us and share the love of Christ! It’s almost Christmas! 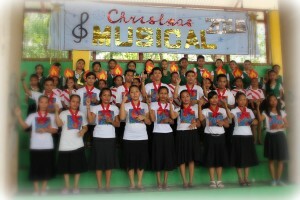 To celebrate this special season, our church hosted a Holiday Musical. This year our theme was “It All Points to Jesus!” Each year our program has grown and 2015 was no exception. 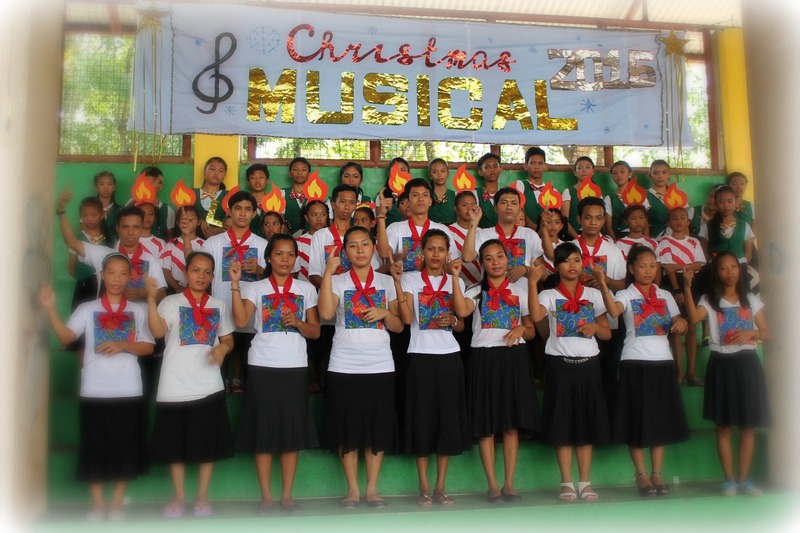 We had 102 of our children singing the Christmas story to their parents! Because of our growth we had to move our program from our church to the local school gym. We had 374 people attend! 374 people who heard the Gospel. There were many that wanted to know more about Christ and were able to hear a personal presentation of salvation. After the program all the kids were given a food basket and new flip flops! This special program has given our church a wonderful opportunity to help these families both spiritually and physically. Now we pray that these parents will think about God’s greatest gift, Christ, and accept Him as their Savior! Christmas…it’s a time to reflect on the greatest gift given to mankind, Jesus Christ! 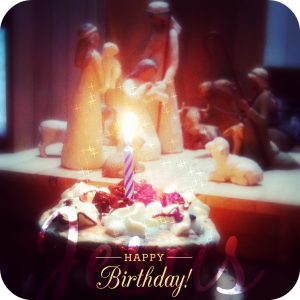 Though the Lord was not born on December 25th, it is the day we set apart to celebrate his miraculous birth. The proof of God’s love came in the form of a little baby…a baby who was born to die for the sins of man. Different cultures have different ways of celebrating but for the Christian the emphasis is still the same, no matter where you live. 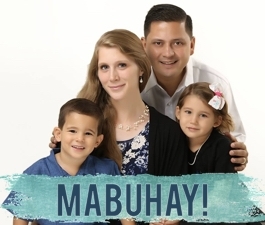 Here in the Philippines, we celebrated in Filipino tradition on Christmas eve. We got together with our college students and church staff around 11:00 p.m. and celebrated past midnight. Christmas dinner was served around midnight and then the students exchanged gifts. It was a really fun experience (excluding the heartburn :) ) and we really enjoyed it. Then on Christmas morning we celebrated the American way-our kids woke up and opened their treasures. Later we had a birthday cake for Jesus and went over the Christmas story. I am so thankful for these special memories and for our God Who sent His Son to die on the cross! We hope you all had a blessed Christmas with your friends and families!